Mix the finely ground chocolate cookie crumbs with melted butter. Spray an 8” or 9” spring-form pan with shortening. Press crumb mixture into bottom and up the sides ¾’s of an inch. Refrigerate until hard. Whip half of the cream with half of the yolks until mixture begins to thicken. Add half of the sugar and continue whipping until stiff. Add half of the sour cream and whip until glossy. While still mixing, drizzle in half of the Amaretto. Fill the refrigerated crust with the whipped mixture. Freeze until firm. Mix room temperature fudge until softened then stir in half of the almonds. Spread fudge over froze mousse and place back in freezer. Repeat the steps used to make the mousse for the other half of the ingredients. Place the remaining mousse mix on top of the fudge. Top with remaining almonds and freeze again until firm. Remove from pan and slice from frozen to serve. Melt chocolate in a bowl over a pot of boiling water. Add cream, Half-and-Half and sugar. Cook slowly until sugar is melted and things have combined. Fold in vanilla, salt and liquors. Whisk in cold butter pieces until melted and blended. Cool to room temperature. Store refrigerated until use with Italian Amaretto Mousse Pie. This is a great fudge sauce to keep on hand in your refrigerator. Heat oven to 350°F. Place almonds into oven and toast for 6 to 8 minutes or until lightly golden. Melt sugar slowly over low heat until fully melted. Remove from heat and immediately drizzle thinly in a zigzag pattern over all almonds. Spread out onto a parchment-lined tray and allow to cool. 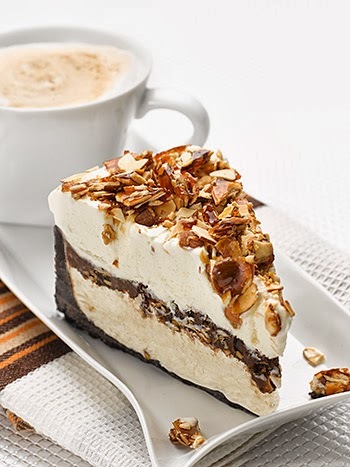 Break apart into manageable pieces and store at room temperature until use with Italian Amaretto Mousse Pie.